When you think of Thanksgiving, what comes to mind? Probably a major feast of turkey, rice and gravy, dressing, and pumpkin pie. For dieters on a weight loss program, this can be a difficult time if you are not prepared. We care about your weight loss success so we want to share with you a Special Thanksgiving Ideal Protein Menu created by Ideal Protein’s Chef Verati. It’s a three-course menu that you can make and it is completely guilt-free! 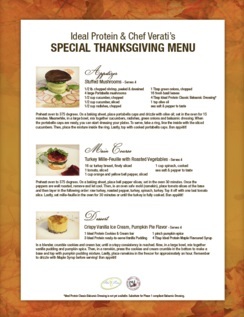 You can enjoy Stuffed Mushrooms, Turkey Mille-Feuille with Roasted Vegetables and Crispy Vanilla Ice Cream with Pumpkin Pie Flavor for dessert! Now that sure sounds like a feast! To view and print the full Thanksgiving Menu, click on the link below.